New rules announced by a Chinese province last week to allow interceptions of ships in the South China Sea are raising concerns in the region, and in Washington, that simmering disputes with south-east Asian countries over the waters will escalate. The move by Hainan province, which administers the sea for China, is being seen by outside analysts as another step in China’s bid to solidify its control of much of the sea, which includes crucial international shipping lanes carrying more than a third of global trade. The rules, however, remain vague and open to wide interpretation, and on Saturday a top Chinese policymaker on matters related to the South China Sea tried to calm worries inspired by the announcement. Wu Shicun, the director general of the foreign affairs office of Hainan province, said that Chinese ships would be allowed to search and repel foreign ships only if they were engaged in illegal activities (though these were not defined) and only if the ships were within the 12-nautical-mile zone surrounding islands that China claims. Advertisement While Mr Wu’s assertions may calm some fears about disruption of shipping lanes, it nonetheless suggests that China is continuing to actively press its claim to wide swathes of the sea, including dozens of islands that other countries say are theirs. And top Chinese officials have not yet clarified their intent, leaving room for speculation. The new laws, passed by the provincial legislature, come less than a month after China’s new leader, Xi Jinping, took office, and as China remains embroiled in a serious territorial dispute with Japan in the East China Sea over islands known in China as Diaoyu and as Senkaku in Japan. The laws appear to have little to do with Mr Xi directly, but they reinforce the fears that China, now the owner of an aircraft carrier and a growing navy, is ploughing ahead with plans to enforce its claims that it has sovereign rights over much of the sea. If China were to enforce these new rules fully beyond the 12-mile zones, naval experts say, freedom of navigation would be at stake, a principle that benefits not only the United States and other Western powers but also China, a big importer of Middle Eastern oil. As in many aspects of the increasingly heated arguments over China and its role in the South China Sea, the exact meaning of the new regulations has not been explained yet by top Chinese officials. In an interview here on Saturday, Mr Wu said the new regulations applied to all of the hundreds of islands scattered across the sea, and their surrounding waters, including islands claimed by several other countries such as Vietnam and the Philippines. ”It covers all the land features inside the nine-dash line and adjacent waters,” Mr Wu said. The nine-dash line refers to a map that China drew up in the late 1940s that demarcates its territorial claims – about 80 per cent of the South China Sea. That map forms the basis for China’s current claims. Some neighbouring countries were outraged when China recently placed the nine-dash map on its new passports. Vietnam has refused to place its visa stamps in the passports as they are, insisting a separate piece of paper be added for the stamp. 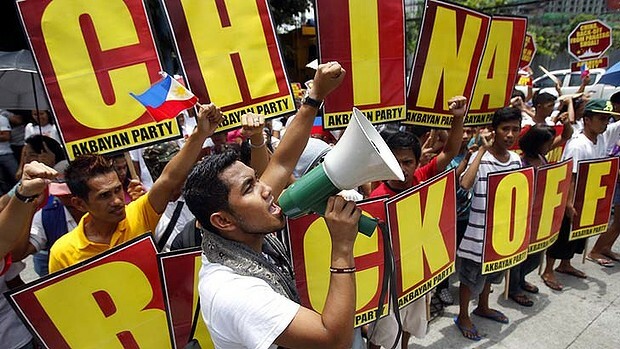 The Philippines, an ally of the United States and one of the most vociferous critics of China’s claims in the South China Sea, reacted strongly to the new rules.